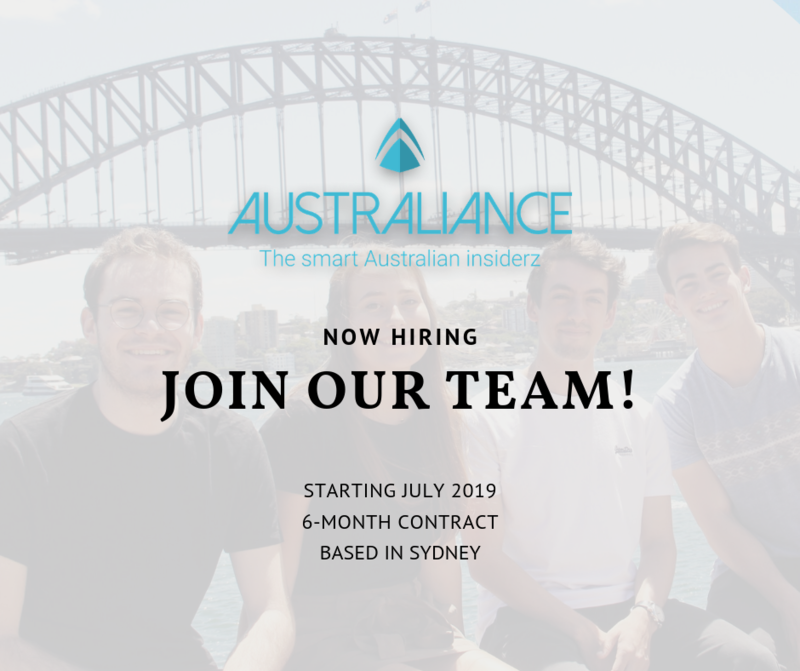 Australiance’s internal positions : Join our team! You are looking for a 6-month internship in Australia starting from July 2019 ? Find you dream internship Down Under within Australiance. Organization of startup networking events (StartupAndAngels.com) and B2B conference (B2BRocks.co/Sydney). We are seeking for Australian and international students looking for a 6-month internship in a start-up, capable of taking ownership of innovative projects and who desire to take initiatives and rise to the challenges in a start-up environment. To support and develop our International Talent Acquisition solutions, we are looking for an intern from a Business School or University to take on the role of International Talent Acquisition Intern. Assist in any other ad hoc HR related projects such as team building, procedure definition, process design and implementation etc. To help growing business – consulting activities (market research,, business development, implementation planning, business set up, temporary management), we are looking for an intern from a Business or Engineering School to take on the role of our International Business Development Intern. In a start-up environment, you will be working on current projects (GoExpat, Australiance) and new projects as well (such as BookAngkorTukTuk.com, laFrenchTech.com.au). The GoExpat project, the international version of Australiance. It’s the 1 st marketplace assisting professionals,, entrepreneurs and businesses plan their projects abroad. There will be one GoExpat for each country and GoExpat Singapore is the first of a long series. BookAngkorTukTuk is an online platform that allows customers to book TukTuk to visit Angkor temples in Cambodia. La FrenchTech is a platform that registers French companies in the Tech industry to help them develop their activity in Australia. You’ll be helping with the management of our customers,, partners and contributing to our digital content to ensure high-degree of customer satisfaction, grow our sales, online presence and international customer base. Dealing with the social media and web-marketing of the four websites: write engaging content, improve visibility and find new strategies to reach more people. Participating in the management of the different websites’ content-testimonials, videos, newsletters. We are looking for an outstanding and experienced intern majoring in Marketing, Communication or Event Management to manage the organization of our B2B events series in the APAC region, as well as supporting our B2B Business Development. Reporting to the founder & CEO and supported by a small team to manage, you are in charge of organizing the events for our community in the B2B space (series of B2B Rocks and Start-up & Angels) and supporting the growth in the B2B consulting activities. Organize the next edition of B2B Rocks (B2BRocks.co/Sydney), a leading B2B conference gathering B2B and SaaS startups in Sydney. You will be assisted by another interns. As event manager, you will be in charge of managing existing partners, identifying and confirming new sponsors & speakers, managing the communication and media relationships, building & following up the event budgets, as well as orchestrating the operational day to day organization with all stakeholders (including attendees). Organize several editions of Startup & Angels series in the APAC region (StartupAndAngels.com) by finding new speakers, sponsors and partners while driving attendee traffic with strong communication plan. Support the B2B Business Development of Australiance by identifying new prospects, assisting the management in building proposals and as required support the implementation of consulting solutions for these clients. We are looking for an outstanding and experienced intern majoring in Marketing, Communication, Social media science and web analytics to manage our platforms and interact directly with our clients. You need to have good graphic design, writing and editing skills in at least two languages. With the guidance and assistance of the management, you are in charge ultimately assisting in growing the business by increasing our online visibility & brand awareness as well as grow our customer and partner base. Participate to the overall digital strategy of the company. Manage our online marketing and communication activities (by creating visualcontents, articles and newsletters) and animate our social media. Acting as Australiance webmaster, you also update our websites and liaise with our web agency as required. Support the B2B Business Development of Australiance by identifying new prospects (clients and partners), assisting the management in building proposals and as required support the implementation of consulting solutions for these clients and partners.